& Layered Templates by Myself? 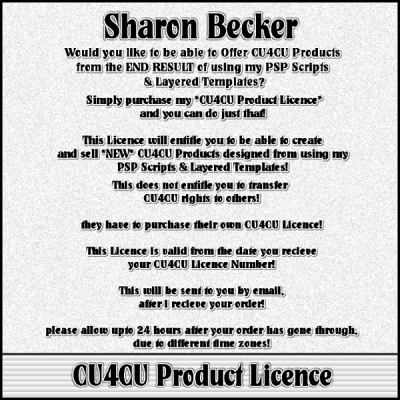 Well just Simply Purchase My CU4CU product License"
and You can do Just That! using My Scripts & Layered Templates. in Conjunction with this License MUST be Merged to a Single Layer. This does NOT Entitle You to Transfer CU4CU Rights to Others. *Scripts & Layered Templates MUST be Purchased Seperately. *No Download is Available with this Product. in the comments section of your order! you wish on the Licence in the comments section of the order! in the comments sectionof the order! Please display this Licence Tag on Your Site/Blog.